I'm a an experienced/inexperienced paddler, is this trip appropriate? Halong Bay is great for beginners, the hundreds of limestone peaks forming a calming barrier to the churning South China Sea. Our guides provide and introduction to paddling and safety skills before we are on the water. A small group size also means more quality time with your guide who will help you improve your skills. There are also numerous beach coves to haul your kayak up onto and relax. For advanced paddlers we have imported Seaward and Phoenix kayaks, miles of open water, caves and winding routes to keep you busy. What are the boats like? Travel to Halong Bay was only recently permitted by administrative authority and there are still many off-limits areas. Tourism is new to the bay, government-controlled, and the boats do not compare to the sleek fiberglass yachts you'll find elsewhere, even in nearby Thailand where private operators can import such boats which is not yet permitted in Vietnam. The wooden boats or cruisers (not actually junks), are newly-built and made specific for overnighting and cruising on the bay. The quality of boats on Halong varies dramatically, and we use only the best quality ones (such as the Valentine on the right). 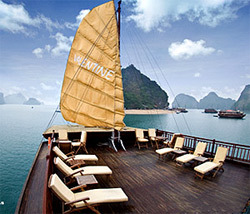 Read more about the boats we use here [Halong Bay Boats]. What is the dining like? Day 1 Lunch:	Fried sweet potato, steamed shrimp with beer, steamed crab with ginger, roasted pork with five spices,	battered tuna in lemon sauce,	stir-fried squid with pineapple and onion,	stir-fried mixed vegetables with	steamed rice and	assorted fresh tropical fruits. Day 1 Dinner: Squid balls in French-Vietnamese baguette with special sauce,	cucumber salad with garlic, chili and lime juice,	mixed seafood soup,	shrimp in sweet and sour sauce,	sweet and sour Halong crab with salt and scallions,	steamed clams with Vietnamese mint and lemongrass,	steamed snapper with fresh ginger and fresh local herbs,	stir-fried seasonal vegetables with	steamed rice and	assorted fresh tropical fruits. Day 1 & 2 Breakfast: Baguettes with fresh butter, cheese, and jam, bacon, sausages, omelets, with milk, tea, coffee and orange juice, and fresh local fruits. Suggested extra dishes for vegetarian: Cabbage roll in tomato source with mushrooms and clear noodle Tofu with salty chili and lemongrass Vietnamese pate with "thousand year egg." Day 2 Lunch: Seafood & vegetarian spring rolls, French fries (the best you've ever had), spring soup, fried Japanese shrimp, pork curry with stir-fried vegetables, steamed white rice	and fresh fruits. Day Dinner: Stewed chicken with lemongrass and perfume mushroom,	mixed salad,	shrimp soup, Beef in wild betel leaf with fish sauce and peppers, fried rice with mushroom and mixed vegetables, fresh baked catch-of-the-day, pork rib BBQ with cinnamon,	stir-fried vegetables with steamed rice and fresh fruits. Day 3 Lunch: BBQ squid with lemongrass and chili,	fried shrimp, mixed salad, sweet corn soup, stewed fish with white wine, caramelized clay-pot pork, sauteed beef with green beans, baguettes	with stir-fried vegetables,	steamed rice and fresh fruit. Imported wines, spirits, beers and canned sodas available at extra charge. In an environment where there is an extreme variance in quality, we operate the best trips on the bay. We lease the finest boats on the bay, maintain a small group size, hire licensed experienced guides with imported kayaks, not inflatable or hard plastic kayaks. 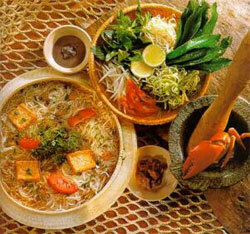 Our onboard chef also prepares delicious, local and seafood dishes from fresh, local catch. We are the only tour company that includes International SOS emergency medical and evacuation coverage with your tour. SOS operates an emergency clinic in Hanoi and also arranges for emergency air evacuation from Vietnam if necessary. It varies by time of year. Please see our weather page. However, it is never really too cold to kayak the bay and the water stays a comfortable temperature. Have a look at our three-day itinerary. This is a rough guide — if you on are a private tour or in a small group we can modify the itinerary to you desires. Departure from your hotel in Hanoi is typically between 8 and 9:00 AM from Hanoi and returning the second or third day by afternoon. On the bay, we typically kayak mornings, break for lunch and then kayak until dusk followed by dinner featuring freshly caught seafood. However, you are always free to explore the beaches, islands or stay onboard to relax. What is provided and what do I need to bring with me? 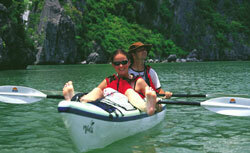 We provide all kayaking, safety, camping and dining equipment. Please read our packing list for recommended items to bring. How many people are on your trips? All of our trips have a maximum of eight travelers, but there are often less. We do recommend securing a private boat for families and small groups of friends. What type of people are on your trips? Our groups are a mix of people from around the world, usually friends, families and couples. We frequently have honeymooners and our trips are also available for private bookings. If you would like to contact us directly, you may e-mail us. Or, please contact us by phone at: (415) 680-3788 . If you are already in Vietnam, please stop by one of our offices which are conveniently located.